MA: You didn’t make it easy on yourself picking one of the biggest horror franchises to base your fanboy movie on. What special precautions did you take in order to avoid getting a Cease & Desist letter on day one? VD: Luckily for us Friday the 13th is one of the most fan supported film franchises in cinema. There are countless fan films already online along with a large community of mask maskers, graphic artists, and news blogs dedicated to the series. From what we could tell the rights holders of the series seem to enjoy the extra attention and didn’t expect too much trouble. That being said, we didn’t take the matter lightly. When we started out in early 2016, a Star Trek fan film by the name of “Axanar” had just successfully raised $1.5M through crowdfunding and in turn quickly brought down a swift legal hammer from the studios. From the fall out of that case came a set of unwritten guidelines for fan filmmakers which we decided to use as our template. Throughout the campaign we also did our best to reach as many publications as possible, so the studios were aware of our intentions. If at any point they had an issue with our project, we’d have complied with any and all of their requests. MA: Did you know from the outset that you’d need to run a kickstarter campaign to bring this movie home? How was that campaign run? VD: The idea to run a kickstarter campaign came only after we discovered the abandoned “College Camp” in the summer of 2016. Prior to that, we had already filmed our first trailer and could have easily executed the original premise without additional funding. However, the camp find presented a great opportunity to blow the scope of the film wide open, but we also knew we’d need serious funding to make that happen. After browsing the kickstarter archives, we found several fan films that had successfully run campaigns for upwards of $50K. I reached out to a friend, Ivan Van Norman, who’d successfully ran several crowdfunding campaigns. He helped us piece together the proper elements for ours. Aside from taking the time to carefully film our pitch video and set up the campaign page, running a successful campaign demands constant up keep. Whether it was reaching out to press outlets or constantly posting on various social media sites, we found a direct correlation between times when we were actively working on fundraising versus letting it coast on its own. MA: What’s the timeline for this project, from pre-production all the way to premiering at Telluride? 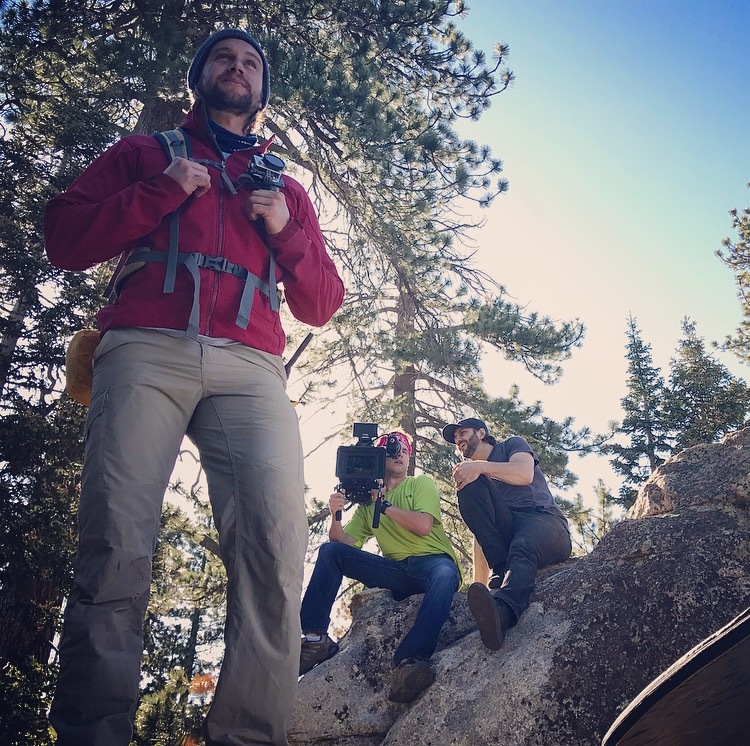 VD: The Never Hike Alone project officially began in the late winter of 2015 with the recruitment of a team of local filmmakers who were interested in the initial premise. In the early winter of 2016, a small group of us began scouting various locations in Southern California that I had either hiked personally or had been recommended to us. In April/May, 2016, we shot the initial trailer over two days. On day one, with just five people, around a set of seasonal cabins in Big Bear and then simply Andrew, myself, and a camera on a trail behind my apartment in Malibu on day two. My wife, Sarah C. DiSanti, cut the trailer in a week and we released it on Friday the 13th in May, 2016. Even as a bare bones version of the eventual film, the initial trailer received positive attention for its production values and even found its way onto Fridaythe13thFranchise.com. At that point, we knew we had something the fans were interested in, and we started planning for actual production. In the summer of 2016 we discovered the abandoned “College Camp”, a mile down the road from the seasonal cabins, the location for the original trailer. Over the summer and early fall, we began scouting the new location and tailoring the script to fit specific rooms and buildings we deemed essential to telling the story. We also expanded our team to include departments such as make up FX, stunts, grip and electric, and more. We also took the time to test camera equipment and block action scene by scene. Once we had thoroughly vetted the production of the film, we turned to Kickstarter to begin raising funds in September of 2016 with a goal of $40K. Unfortunately we fell short of that goal but were able to convince some of our backers to support us privately outside of Kickstarter. That allowed us to raise our initial $20K and allow us to start shooting with the hopes of returning to Kickstarter at a later date for the rest. With private funding in place, principal photography kicked off late September, 2016, but we truly didn’t get into the narrative scenes until mid October. Since most of the crew worked full time during the week, we shot over six consecutive weekends made up of 2-3 days, each trip with varying degrees of production complexity. Some weekend times we shot with a crew of 25 and a grip truck full of equipment, while other days we shot with a crew of 5 and whatever equipment we could carry in our personal vehicles. Just as we hit the halfway mark of the film in early December 2016, a large winter storm came in and buried the camp in snow. We had no choice but to go on hiatus until spring. At the time, pausing production seemed daunting but it may be the thing that saved the production. Throughout the fall we were running into a combination of bad luck, technical errors, and still forming a rhythm as a team. Having time over the winter to assess what we were doing wrong helped us shape our approach in the spring. It was also at this time I decided to step away from my full-time job and concentrate solely on the project. Our first task was to return to kickstarter and raise the remaining funds, which we did with the help of a brand new trailer featuring footage from the camp. Having the opportunity to focus on kickstarter full time made a big difference. We were able to raise our goal of $13K well ahead of our deadline and finished just shy of $19K. We returned to set in early May of 2017 with a whole new approach and right away saw a big difference. Days were running smoothly and we seemed to be reaching the quality we knew we were capable of. Each week we would focus on a few key scenes and ride each successful weekend into the next. Scheduling was probably the biggest challenge as most of the crew was still working full time, but everyone was very proactive in setting dates aside until we finished our last round of pick-ups in early August. While we were shooting, our editorial team of Lawrence Gan and Sarah set up the project for post and cut the first rough assembly of the film. Once large sections of the film came together, we assembled our post crew, which consisted of Ryan Perez-Daple on music, Austin Healy on sound, Josh Grow on VFX, and Pepper Tree Post for online, color correction & mastering. We also had a great opportunity to mix the film on a professional sound stage at Sony Pictures Post when a few of their sound / mix artists caught wind of the project and volunteered their services. With the picture locked in early August we were under the gun to hit a deadline of Friday the 13th in October. Luckily, everyone moved swiftly and we ended up exporting the final picture with less than a week before the release. Our original goal was always to release the film for free on YouTube, however, we found ourselves with a unique opportunity to premiere at the Telluride Horror Show after I met one of their programmers, Brad McHargue, while playing Friday the 13th, The Game online. We had both ended up in the same lobby and he overheard me talking about the film with some of the people I was playing with. Someone had asked if I would be doing screenings at festivals and I mentioned Telluride as being the one place I thought would be perfect. That’s when Brad’s ears perked up and we started talking. Less than a week later I was put in contact with the festival director, Ted Wilson, who gave us an open invite to submit the film when it was ready. On September 15th, we submitted a work print of Never Hike Alone to Ted and his team and out of the 800 submissions they received that year, we were invited to participate! On Friday the 13th 2017, Never Hike Alone made its world premiere at the Sheridan Opera House in downtown Telluride, Colorado, in front of a packed house of excited fans. The response from the audience was really positive and it was one of the festival highlights. What seemed like a pipe dream early on in the process ended up being an experience I will certainly never forget. Never Hike Alone simultaneously launched online with the live screening and by the time we walked out of the theater the internet was already buzzing. After almost two years of work, it was a pretty amazing feeling to see it all pay off in a matter of hours and. By the time the festival came to a close on Sunday, the film had reached over 30,000 views on YouTube and received a wave of glowing reviews from various media outlets. Most importantly, we were hearing from a lot of lifelong fans of the Friday the 13th series who hadn’t felt that good about a Friday film since the 80’s. When we started to project, we couldn’t have predicted the attention Never Hike Alone would generate. We’re just grateful that Friday fans have something to smile about after waiting so long for the studios to figure out their next move. MA: How many days of Principal Photography did you have, at how many locations? VD: Overall, I would say 20-25 full days of principal in four major locations. Again, we were breaking up the shooting into multiple weekends with scout and construction trips mixed in, so it’s tough to lock down the total time on or around set. Out of those days we were actually shooting, I would say there were 8-10 dedicated night shoots with the full crew. Our main location was the abandoned “College Camp” and the surrounding area which was located about 15 miles outside of Big Bear. Aside from the camp scenes, we also captured a majority of the driving, hiking, camping, and even ambulance scenes – all within a 5 mile radius of the camp. The dirt road you see Kyle driving on in the film is the actual unmarked road to the camp and the dead end is one of the alternate routes off that trail. Our second main location was the “Unmarked Trail” located behind my apartment in Malibu which involves a steep, 25 minute hike to the location which is no fun at all to climb. The reward of that location is its unique, claustrophobic look that I thought would be a perfect representation of the lost trail to Camp Crystal Lake. We also shot in Big Bear proper in and around a very isolated area known as Bluff Lake. That is where we filmed the initial lake discovery scene and additional hiking scenes. We had to walk a tight rope in that location as there were certain areas we would catch interference for shooting even though we were just out there with a group of five crew members and a shoulder mounted camera. For the “Dream Sequence” we ended up traveling all the way to Lake Mary in Flagstaff, Arizona. Our initial plan was to film at Bluff Lake, but we quickly found out that shooting in and around water in California means an extra $5-8,000 in permit and monitoring fees. It would have also required a scuba diver which blew my mind since I was only standing in about 3-4 feet of water to pull off the final shot. I got the idea for Lake Mary while shooting pick-ups for another project during our winter downtime. Flagstaff has a much more laid-back approach within its film community. I discovered they will let you film just about anywhere as long as you are respective of local community and surrounding nature. That weekend, we packed all we needed into two vans and stayed at an Airbnb, not unlike how we executed weekends in Big Bear. Production cost were relatively on par with other weekends only with a few extra gas stops along the way. It ended up being a two-day trip in which we shot for a total of eight hours starting at 3:00AM to catch the morning magic hour. We received no interference and actually filmed the head crush with fisherman and their families watching us from down the shoreline like we were maniacs. MA: The location for the Crystal Lake campsite is just perfect. How did you find the place? How much of the design was already in place and how much did you have to stage? 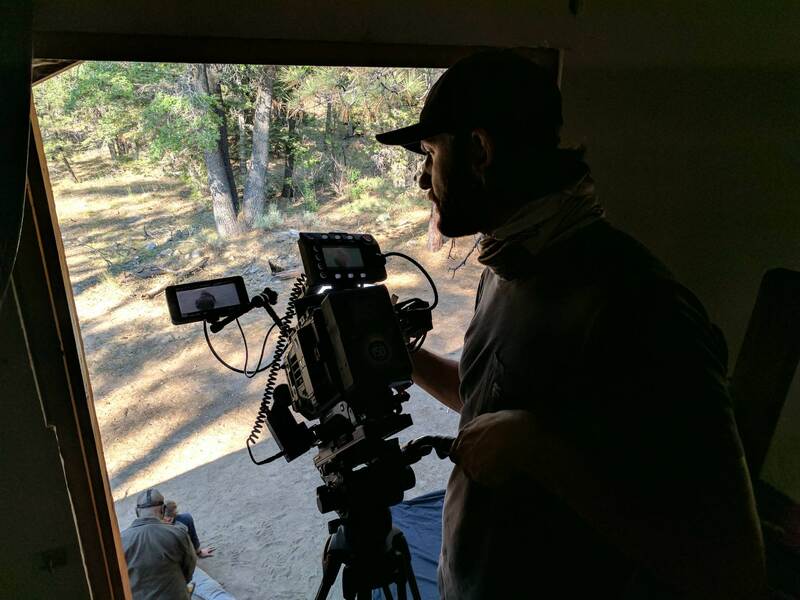 VD: As we were packing up on our first day of shooting for the original trailer at the Big Bear Cabins in April of 2016, a couple who were letting us shoot on their property casually asked if we would also be shooting at the camp. We initially said no since we didn’t have the kind of money for permits or to rent out a camp, but they just laughed at us and said we wouldn’t need worry about any of that. That’s when they informed us of a place called “College Camp” that had been abandoned since the 80’s and it was just a few miles up the road. Only the locals really knew about it. The husband then pulled out an old paper map and showed us where it was located. We didn’t have time to scope it out that day so I took a picture of it with my phone and we headed back to LA. I of course began searching for the camp as soon as I got home but could not find anything on google maps or any information on a place called “College Camp.” It wasn’t about until a week or so later that I began messing around in Photoshop, using a screen shot of google maps and overlaying the old map to get a better bearing on where the camp should be located. Using that reference, I began zooming in and scanning a satellite view of the forest where I eventually found one of the buildings tucked between a grouping of trees. From there I traced a path that seemed like a road leading all the way back to the highway and printed out my own custom map. That weekend, a small group of us took a drive and found the access road to the camp. After pulling in we immediately approached a gate and thought that was the end of our journey right there. However, on closer inspection, we realized it was only held together with a nut and bolt, and no signs stating any sort of restricted access. We unlocked the gate and drove on through. The road probably hasn’t been maintained for over 30 years so it was in rough shape, but we were traveling in an off road vehicle. On the first drive we ended up having to clear some large rocks and even fallen trees blocking the road. After crossing a stream and ascending a long climb with a steep drop, we rounded a corner and saw a cabin which a tree had fallen onto. Just beyond that, the road opened up into a clearing and that is when we found ourselves parked in front of the main cabin. From that moment, we knew we had struck gold; our original premise involved no interior shots and now we had dozens of buildings and countless rooms to choose from and could build whatever we wanted. We soon began making trips almost every weekend. Over that period we never ran into any trouble with locals and were left to do as we pleased as long as we left the camp in a better condition than we found it. To this day, we still take trips to the camp to clean it up for hikers who wander through the area. When we found it, it was full of broken glass, discarded nails, trash, and all sorts of nasty stuff. Over time we’ve been clearing out sections of the camp to simply reduce the risk of injury for any newcomers. We even made friends with a family of bats that live in the attic of the main cabin. That being said, we’ve also left a few crime scenes up there just to keep people on their toes. MA: You used a lot of cameras on this one. Tell us which ones and why? VD: Yes, lots of cameras, but mostly due to the good fortune of upgrading our gear with the addition of key crew members. Our original primary narrative camera was a Sony A7sii with a Shogun Atomos 4K digital recorder. Out of the DSLR options at the time, this offered the closest filmic quality pictures that fit within our budget. However, its major downfall was that it was a difficult camera to rig as it required several accessories that never seemed to work together simultaneously. On top of that, the rig had a lot of trouble keeping up with the physical demands of the fight scenes and slowed us down a ton on set. Just before we started our break in December, we were fortunate enough to add camera man Evan Butka and his Red Epic 8K to the team. We knew Evan through renting his Zeiss lens kit just about every weekend and he became interested in the project after getting to know me over the course of that time. Shooting with the Red made life so much easier from a technical standpoint and of course gave us a beautiful 8K image that would give us much more leeway in post. When Evan wasn’t available, he was kind enough to introduce us to another camera man by the name of Ben Meredith who was equipped with a Panasonic Varicam. Having great low light capabilities, we relied on the Varicam to capture a lot of our night and early morning scenes. Overall that camera is simply a work horse that never let us down or gave us any issues. The unsung hero of the film was Co-DP JD Martz’s personal Sony FS7, which became our B Camera for a majority of the production and was great for guerrilla shooting when the main production cameras were not available. Most of the scene of Kyle running from camp with Jason giving chase was shot with that camera. We also used it for scouting and pre-viz purposes, along with a Canon 5D. For aerial shots, we used a DJI Phantom 3 Professional, which I purchased for myself and learned to fly for the production. I got the hang of it pretty quickly and spent a lot of time practicing specific camera moves I wanted to see in the film. The hardest shot in the entire film was definitely the shot where Kyle runs across the log while the camera dollies forward over a large creek. There was not a lot of flight room over the water and it was an extremely a super windy day. I lost a few shots simply saving the camera from crashing, but it was all worth the stress once we saw the images. For all of the confessional scenes we used (2) Go Pro Hero 4 Blacks, which were both owned by myself and JD. For the broken camera effect, which was practical, JD had an old case that had been run over during a car shoot he was on a few years ago. He had been waiting for an opportunity to use it for something, and Kyle being tossed from the second story of the main building seemed like the perfect use for it.